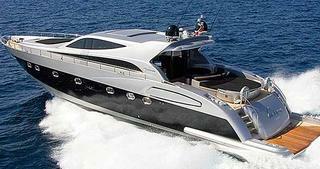 Who could pass on the chance to write up a motor yacht called Von Filth - certainly not me. And now comes my opportunity as her price is cut at Oceanstyle in London. Built by Alfamarine in 2007, this 24m superyacht is powered by twin Caterpillar 1800hp engines delivering a top speed of 48 knots and has three elegantly decorated cabins accommodating up to seven guests. The hydraulic sliding roof creates an alfresco saloon at the touch of a button and she's currently located on the Cote d'Azur. Von Filth was asking €3.395 million and is now down to €2.75 million.